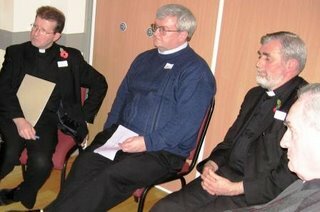 On Friday I was in Catford for the Clergy On-Going Formation day which I had been asked to lead on the theme ov Vocations Promotion. I admit to being a little nervous. I hadn't done anything like that before and priests can be a notoriously difficult audience. Perhaps it's not that they're difficult, but that we are self-conscious addressing fellow clergy. Most of the people in the room - including three bishops - have a lot more experience than me! I broke the day into three parts. In the first we considered why fewer men are responding to God's call today. There was a surprising amount of unanimity in our thinking. It was also clear that the problems hindering a response to a vocation, although real, are not insurmountable. 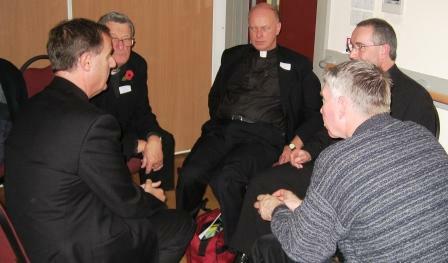 In a second session before lunch we looked at what inspired us to become priests. The reason for doing this is that research suggests that priests are often the best advert for priesthood. If we live our priesthood with joy we will attract others. It was good just to stop and remind ourselves of what is essential to the Catholic priesthood. After lunch we had a final session on promoting vocations today. This both invited suggestions fromthe floor as to how we can encourage vocations and gave something of the rationale behind our work here in Southwark. It was interesting to see that the exceelent suggestions coming from the floor were all things that didn't need a 'Vocations Office'. In other words there are many, many things we can be getting on with in our daily parish life and school ministry that will bear vocational fruit. It was a very worthwhile day and ,despite my initial trepidation, I've received some very kind feedback from some of the participants. Just to thank for today. You gave a fine presentation and, as Gerry said, it was like a day of recollection, which I think was a good thing: little moments of prayer, reminders of the mystery of our own priesthood, the urge to personal apostolate of friendship. It was quite bold of you to speak to fellow priests, and bishops too, in this way. Just a brief note to thank you for a really excellent day today. I will be ‘writing’ to you properly during the week.